Free Shipping Included! Nellie's All-Natural Wow Mop- Cordless, Light-Weight and Rechargeable by Nellie's All-Natural at Blog Free Here. Hurry! Limited time offer. Offer valid only while supplies last. Introducing Nellie's WOW Mop! Cordless, lightweight, rechargeable, the WOW Mop makes cleaning your floors SO easy, you might never want to stop! Introducing Nellie's WOW Mop! Cordless, lightweight, rechargeable, the WOW Mop makes cleaning your floors SO easy, you might never want to stop! Featuring oscillating pads, a high-frequency motor and a long grip handle, you can now tackle dirt and stains completely and effortlessly. The WOW Mop comes with a pair of Nellie's WOW Wet Floor cleaning pads that are machine washable, ecofriendly and can be reused up to 100 times. For best results, use with Nellie's Floor Care and launder your cleaning pads with Nellie's Laundry Soda. Great for hardwood, tile, ceramic and more. 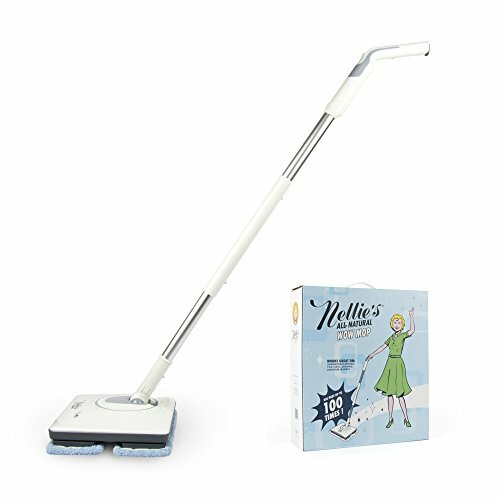 HOW TO USE: Dispense Nellie's Floor Care into the tank (200mL/6.7fl oz), press the power button and let the WOW Mop do the work. Your floors will be spotless, and your mother-in-law speechless. WOW, indeed! WHAT'S INCLUDED: A set of Nellie's WOW Wet Floor cleaning pads, measuring cup, charging cord, user manual. Wireless- take the mop with you throughout the house without fussing with a cord. One charge will last up to 50 mins. It's adjustable height allows for comfortable handling and can turn into a kid friendly mop! The Wow Mop uses two large pads at the bottom so you will never miss a spot! Innovative ergonomic design- Nellie's Wow Mop is able to reach and angle into those hard to reach places. No more straining or hard bending! If you have any questions about this product by Nellie's All-Natural, contact us by completing and submitting the form below. If you are looking for a specif part number, please include it with your message.